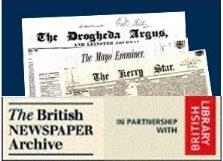 Historical editions of the County Down Spectator have joined the online British Newspaper Archive (BNA). This weekly paper, which is still published in Bangor, Co Down, was established in June 1904 and is now being managed by the 4th generation of the founder's family. It's full title is the County Down Spectator, and Ulster Standard, as you can see from its masthead below. The initial upload makes 560 pages from 70 editions published in 1905 available to search via the BNA database, which is shared with FindMyPast's Irish Newspapers collection. The BNA now holds 46 titles from Northern Ireland and a total of 170 island-wide.